My Lonely Planet Guide to Europe says, “Germany is famous for beer, BMWs and invading Poland” (Europe on a shoestring, Lonely Planet Guide: p446). Invading Poland is rarely spoken about (for obvious reasons!). BMWs are everywhere, and seeing them fly past you on the Autobahn at 200Kms/H+ is a daily occurrence. I must also agree with the book, that beer in Germany is sehr gut. Last Friday I went with Britty to a local pub for some dinner, and a drink. The pub served beer brewed in house. The beer I decided to sample was called “Kieler” beer. The beer cost me 2€ for 500ml, and was just beautiful. In most pubs the standard tap beer is Becks. Depending where you go, you can get a Becks, from tap, from between 2€ and 4€. If you want a bottle, it will cost you about 2.50€. There are of course many other beers and these vary in price. I am looking forward to sampling some of the beers from Southern Germany later in the year when I go to Oktoberfest. Drinking at home, and then heading out is a very good option for those that want to save money. In Germany you can get beer at any servo, small food shop, takeaway food shop, or supermarket. 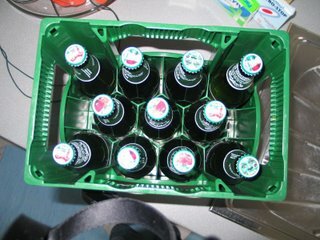 Two days ago I purchased a six pack of Becks for 3.70€. That is about 0.67€ each. Not too bad I have to say! A few weeks ago I purchased a box of Carlsberg for 8.70€. 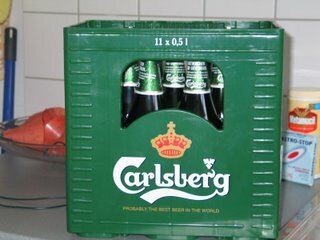 The box contains 11 x 500ml Carlsberg’s, which are extremely nice, and drinking 2 of them will get you drunk pretty quick. The actual price of the beer is only 6.20€, because when you return the empty bottles and the box, you get a 2.50€ refund. Not a bad price that’s for sure. This is what you get! Check out the photos. The price of beer here is unreal compared to Australian prices. If you go down to the local bottle shop in Australia, buying a 6 pack of beer will set you back between $12 – $19. Here the same six pack costs you 3.50€!!! Even if you convert, it still works out cheaper (1AUD = 0.60 Euro approx.). I guess the motto of the story is, people from Australia come and visit, and drink some beer with us!!! !